When it comes to pool safety, the most important concern to keep top of mind is preventing accidental drowning. While it’s often portrayed as dramatic, loud and very eye-catching in the movies, in real-life drowning is often silent. Here’s more information on how to spot the signs of drowning. Another safety concern when using an above ground swimming pool is safe ladder use. Falling from a pool ladder can result in cuts, bruises, scrapes, broken bones and even head injuries. You’ll also want to ensure children stay clear of any drains or pumps attached to your pool in order to prevent injuries. While they are generally considered safe when used with care and according to the manufacturer’s instructions, injuries can and do still occur. The Consumer Product Safety Commission’s (CPSC) National Electronic Injury Surveillance System (NEISS) estimates there were approximately 1,743 injuries to children under the age of 18 caused by above ground and inflatable pools that were treated in United States hospitals in 2014. In addition, the 2013 Pool and Spa Submersion: Estimated Injuries and Reported Fatalities Report from the CPSC found that on average 390 children under the age of 15 died as a result of drowning between 2008 and 2010. The CPSC reports drownings are the second leading cause of accidental death around the home for children under 5 years of age, with it being the the leading cause of accidental death in the home in some warm weather states. The number of actual injuries caused by pools is likely quite higher than reported, as the data from the CPSC only looked at those injuries which resulted in medical treatment at a hospital, and minor injuries were likely treated at home or another medical treatment facility not included in the reporting data. Depending on what state you live in, there are varying codes for pool setup, maintenance and safety measures. Be sure to research what the standards are and what’s required before purchasing your pool. Safety standards for pools have been created by a mix of consumer groups, government agencies, and manufacturers and are completely voluntary. Look for a sticker on your pool that tells you it’s been approved by CSA, ASTM, UL or some other such safety association. The Pool and Spa Safety Act was designed to help prevent drain entrapments and eviscerations in public pools and spas and has been in effect for all public pools since 2008. The ASTM Committee F15 on Consumer Products has also created standards for pool and spa safety covers, permanent barrier fencing, and pool alarms. Aftermarket products, such as locking pool covers, can help prevent accidental drownings when the pool is not in use. You may also want to invest in fencing with an auto-locking gate to further increase safety. Depending on your local state and municipality laws, fencing may be a requirement – be sure to check with local authorities before installing your pool. You can also purchase underwater alarms that sense when a person is drowning and send out a loud signal. If your pool came with a warranty or registration card, make sure to complete the form and mail it in to the manufacturer. This way, you’ll be notified of any recalls or other safety information in the event of a problem with your model. Surveys done by Consumer Reports National Research Center show that most people seldom or never take this essential safety step. Have a trained professional install your pool and ensure you’ve made allowances for any space or other clearance requirements necessary for safe installation. If possible your pool should also have its own dedicated spot on your electrical circuit (with a GFCI outlet) to prevent power overloads and other electrical problems. Drowning can happen to adults and children alike, no matter how deep the water inside of the pool is, and takes just seconds to occur. Drowning deaths are almost always preventable, so it’s crucial to practice certain safety measures each and every time you use your pool. Do not swim in your pool if you are under the influence of alcohol, drugs, or certain prescription medications. You should also not supervise young children if you are under the influence, as your reaction time may be delayed. Teach children basic water safety tips and consider investing in swimming lessons so they have valuable lifesaving skills. Do not leave children unattended in a pool. If your youngsters are not strong swimmers, you may want to fit them with a personal flotation device before they enter the water. Water wings are not an acceptable flotation device. Ensure long hair, loose clothes and jewelry are tied back or removed. Institute a “no-horseplay zone” around and in the pool in order to keep little ones safe. Remove the ladder from your pool when not in use to prevent children from climbing up and accidentally injuring themselves. Always read and follow the manufacturer’s instructions for installation, use and cleaning of your pool, and don’t hesitate to contact them if you have a question about something specific that isn’t covered in your user manual. Ensure there is adequate ventilation before you begin cleaning or adding chemicals to your pool. The fumes from many pool cleaning chemicals can be toxic and make you ill.
Use chemicals with the appropriate measurements to maintain a healthy PH and store them out of reach of children. Keep them out of direct sunlight and in their original packaging. Thoroughly remove any residue from cleaning products before you use your pool to swim again. With the above tips in mind, in no particular order, here are 28 of the pools we consider to be the safest, based on available features and average customer reviews and ratings. This pool is the perfect size for those who aren’t sure they want to commit to an in-ground pool or just want to lounge and stay cool all summer long. This pool offers an extra-large size that’s perfect for families and backyard get-togethers and comes complete with everything you need to get set up in no time. 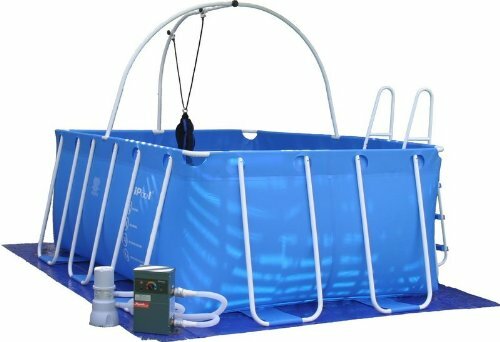 This above ground pool quickly and easily sets up in as little as an hour and features a filter, cover, ladder and included maintenance kit. 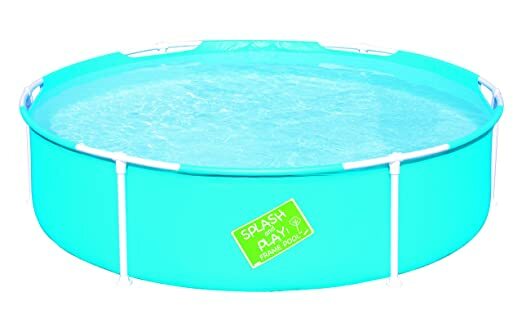 This circular above ground pool is the perfect size for backyard use and features reinforced rope wraps around the bottom of the liner in order to ensure the legs are kept firmly in position. 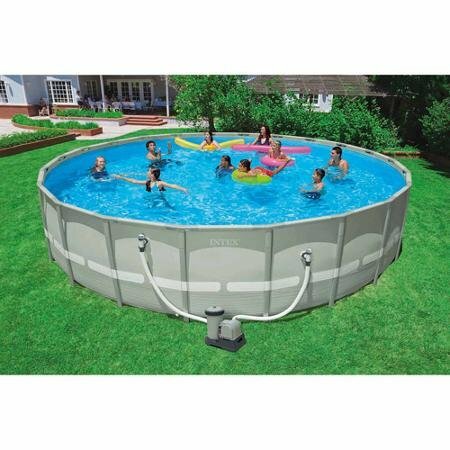 Easy to assemble and maintain, this circular-shaped above ground pool is sure to provide your family with years of outdoor fun in the sun. 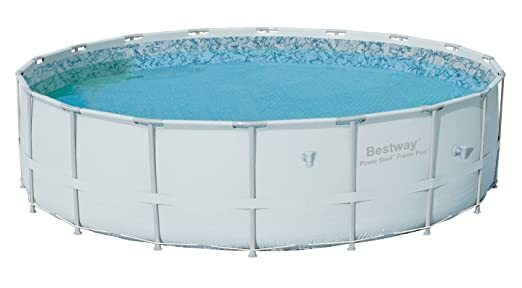 Ideal for both large groups of swimmers and quick dips to cool off, this circular frame pool comes complete with everything you need to get set up and swimming quickly with little hassle. This pool is offers a smart and stylish design and comes complete with a liner to offer a quick install so you can enjoy all the fun summer has to offer. This pool kit comes complete with a new-and-improved filter pump, ladder, maintenance kit and debris cover – just add water and your family will be splashing around in no time. Easy to assemble and maintain, your family can stay cool in the summer heat thanks to this perfectly-sized above ground pool. Pump, ladder and pool cover are all included. 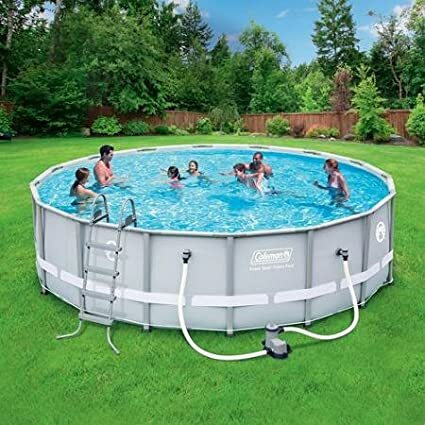 This circular above ground pool offers an affordable and durable backyard swimming solution. Its super strong steel walls have been hot dip galvanized for additional protection. 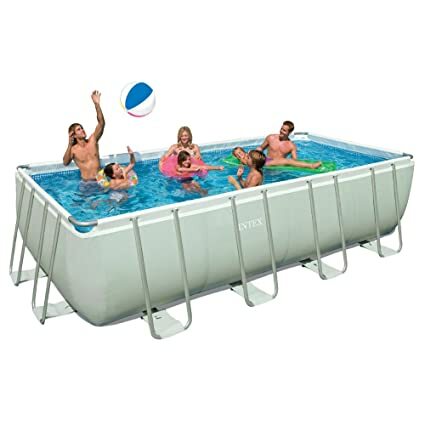 Thanks to its compact size, this float to fill pool is the perfect choice for smaller backyards or those who aren’t looking to commit to a permanent pool solution. This rectangular-shaped above ground swimming pool is perfect for backyards with a little more space or narrow dimensions and those looking to work on their lap times. This pool is on the slightly smaller size but doesn’t compromise on quality or style. Plus, it’s made in the USA, so you can trust the quality and construction. 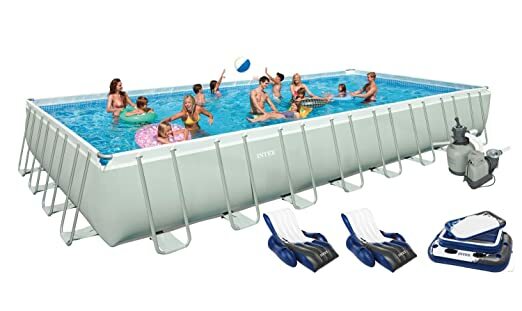 Another great option for those looking to work on their lap times, this rectangular pool is up to 80% stronger than other similar frame pools. This above ground pool is ideal for those looking to get a serious workout in a backyard pool and features a small, space-saving footprint. 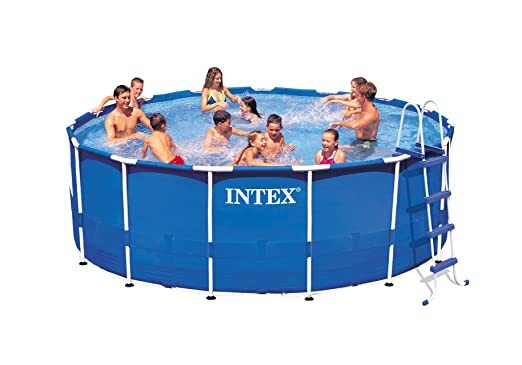 This circular ring pool set features everything your family needs to get swimming – just add water and you’re good to go! 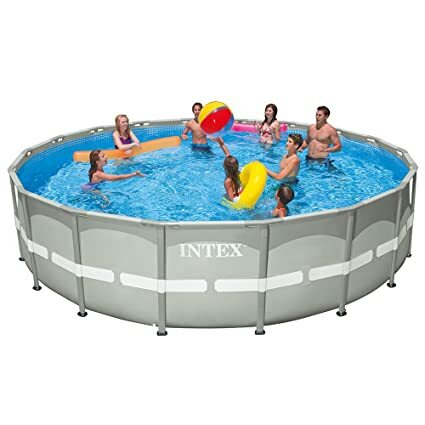 The perfect size for families and backyard pool parties, this circular above ground pool offers smart styling and free delivery for select states. 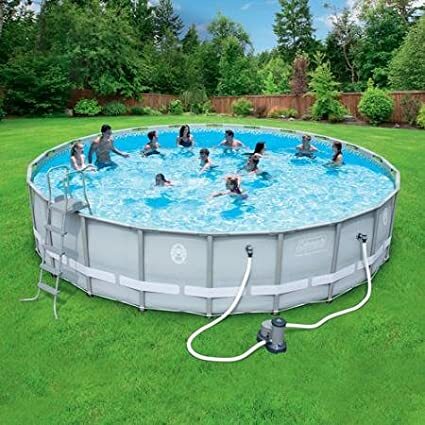 This circular above ground swimming pool features an easy, tool-less setup designed to provide your family with years of outdoor fun and enjoyment. 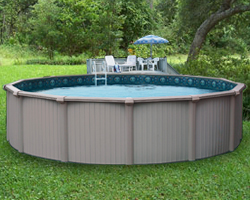 This above ground pool is up to 80% more durable than other similar pools and features a super strong heavy gauge PVC construction. This soft-sided above ground pool is the perfect way for families to cool down and features a quick and simple setup as well as everything you need to dive right in. Suitable for children aged 6 and older, this inflatable pool lets little ones splish and splash to their heart’s content and comfortably fits up to 5 youngsters at once. This above ground pool is perfect for families and comes complete with a volleyball set for hours of outdoor fun and entertainment. 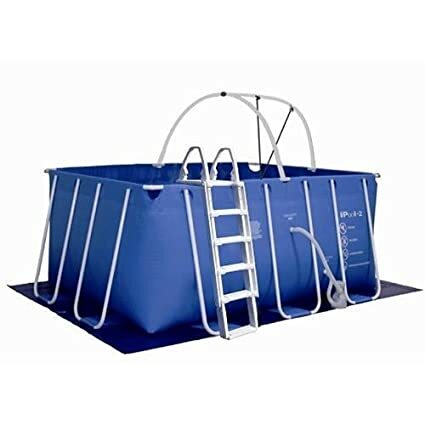 This above ground pool is ideal for those looking to get a serious workout without putting strain on their joints and features a small, space-saving footprint. This pint-sized pool is ideal for families with smaller children and backyards with little space. Thanks to its quick and easy setup, your little ones will be able to enjoy the water in no time at all. 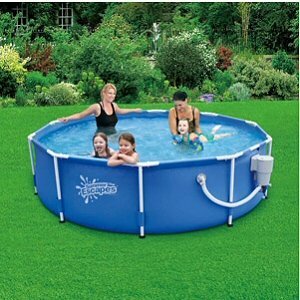 This above ground pool is quick and easy to set up, and is ready to add water to in just an hour. 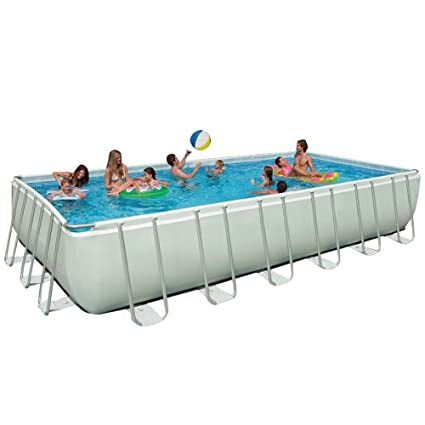 Ultra durable laminated PVC sidewalls allow your family to float and splash all summer long. This pool offers a smart and stylish design and comes complete with a beautifully-designed liner that is quick to install, so you can get outside and enjoy all that summer has to offer. 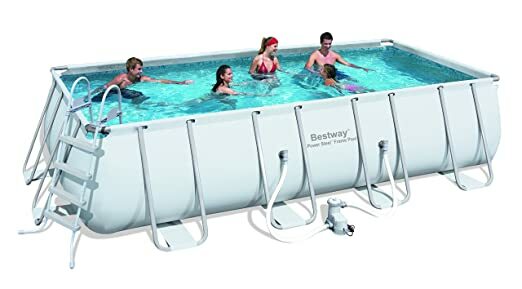 This above ground pool boasts a quick and easy setup that can have you and your family enjoying the water in as little as 20 minutes at a price that can’t be beat. The Bermuda model is the ultimate in above ground swimming pools with a host of luxury features including quality materials and convenient installation that can even be installed semi-in-ground.